The apostles were not blind believers of the resurrection of Jesus. Jesus allowed them to have personal experience of him after his resurrection. Jesus commissioned them to go all over the world and preach the gospel to all humanity. Starting from Jerusalem and with Jews, the redemption through Jesus was proclaimed to all. The believers need to be baptized for salvation. Rejection of faith once received, shall lead to condemnation. Jesus continues to work through his disciples until his second coming when the faithful disciples will be rewarded to be with Jesus who sits at the right hand of his Father. The Commissioning of the Eleven. (19) So then the Lord Jesus, after he spoke to them, was taken up into heaven and took his seat at the right hand of God. (20) But they went forth and preached everywhere, while the Lord worked with them and confirmed the word through accompanying signs. (14) [But] later, as the eleven were at table, he appeared to them and rebuked them for their unbelief and hardness of heart because they had not believed those who saw him after he had been raised. After the death of Judas, the college of the apostles were reduced to eleven. Jesus appeared to them when they were eating at table. 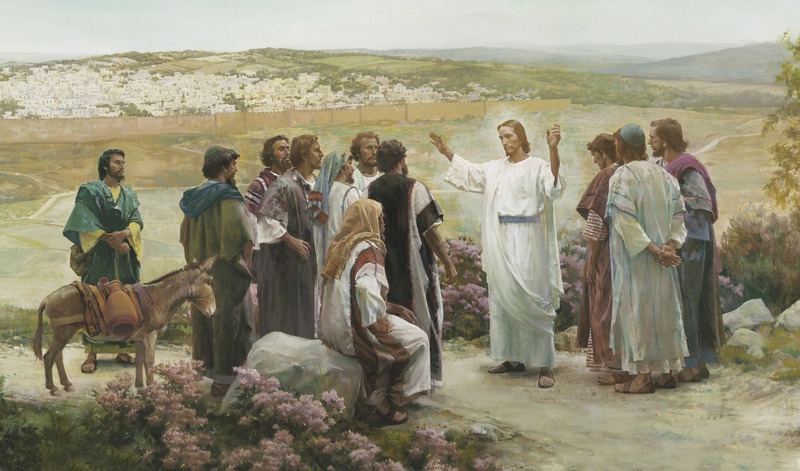 Though Thomas was absent at the first appearance of Jesus to the apostles, Mark has included Thomas in this vision of Jesus to assure the commissioning to all the eleven. During the Holy Mass, we are at the banquet table of the Lord which is the foretaste of the eternal banquet in heaven. The Lord comes to us and shares his meal with us during each Holy Mass. . The apostles came to know that Jesus had risen from the dead. However, that was from the witness of others who had seen the Risen Lord, including Mary Magdalene, Cleophas and the two disciples who were traveling to Emmaus. Despite the predictions of Jesus on his resurrection, the apostles were hesitant to believe in the resurrection experience shared by others. Mark presents it as the hardness of their heart. The physical appearance of Jesus was necessary for their belief. When Jesus appeared to Thomas, he had said, "Because you have seen me, you have believed; blessed are those who have not seen and yet have believed.” (John 20:29). This message is for us who have not seen the Risen Lord physically, yet believe in him. Yes, we are blessed because we believe in the Lord even without physical evidence. Jesus had formerly restricted his apostles from preaching the gospel to the gentiles and Samaritans. (Mathew 10:5). After his resurrection, Jesus commanded them to travel all over the world and preach to people of all nations, regardless of their nationality, language, tribe, and social and financial status. The universality of the gospel and the salvation brought by Jesus was thus declared. The people of God who were dispersed are to be unified in faith in the Lord. The apostles were the representatives of the early church. The commission to preach the gospel to all people all over the world must be continued through all Christians. Thus, we are also responsible to carry out this function in our situations. (16) Whoever believes and is baptized will be saved; whoever does not believe will be condemned. While it is the responsibility of a Christian to communicate the gospel of Jesus, the people who become believers in Jesus should receive baptism. The Catechism of the Catholic Church states: “Baptism is necessary for salvation for those to whom the Gospel has been proclaimed and who have had the possibility of asking for this sacrament. The Church does not know of any means other than Baptism that assures entry into eternal beatitude.” (1257). The unbelief in Jesus and refusal to join the mystical body of Christ through baptism after listening to the Word of God, are one’s own choice for condemnation in the life to come. When Jesus sent out the 12 during his public ministry to preach the gospel to the Israelites, Jesus told of those who would reject them: “it will be more tolerable for the land of Sodom and Gomorrah on the day of judgment than for that town.” (Mathew 10:15). When Jesus spoke of the unrepentant towns, he said: “Woe to you, Chorazin! Woe to you, Bethsaida! For if the mighty deeds done in your midst had been done in Tyre and Sidon, they would long ago have repented, sitting in sackcloth and ashes. But it will be more tolerable for Tyre and Sidon at the judgment than for you. And as for you, Capernaum, ‘Will you be exalted to heaven? You will go down to the netherworld.’” (Luke 10:13-15). (17) These signs will accompany those who believe: in my name they will drive out demons, they will speak new languages. Verses 17 and 18 give a list of extraordinary signs that would accompany the believers of Jesus. Such divine powers were necessary especially in the early church in its budding stage and while the Christians were facing severe persecution. Those were necessary for the preachers and listeners for conforming their faith in Jesus. Some of the signs were for the benefit of others while other signs were to save the lives of the disciples during their missionary trip. These miracles were not supposed to continue forever though some holy Christians performed wonders or others had miraculous experiences in their lives. The apostles who had limited education and language skills could go all over the world and could preach in the languages of the local people. This gift started on the Day of Pentecost when they received the Holy Spirit. “Now there were devout Jews from every nation under heaven staying in Jerusalem. At this sound, they gathered in a large crowd, but they were confused because each one heard them speaking in his own language.” (Acts 2:5-6). At least one such incident is documented in the Bible. While St. Paul was in Melita (Acts 28:3-5) a viper fastened on his hand. He escaped from snake bite. If they drink any deadly thing, it will not harm them. Papias records the oral tradition that Joseph Barsabbas, one of the 70 disciples of Jesus (Luke 10:1) drank a cup of poison without harm. Joseph and Mathias were the two candidates to replace Judas Iscariot, out of which Mathias was selected. Both had accompanied Jesus during his public ministry. (Acts 1:21). Another tradition is that St. John the Apostle was taken to Rome for trial during the time of emperor Nero (56-68), where he drank a cup of deadly poison, but remained alive. They will lay hands on the sick, and they will recover. The Acts of the Apostles gives several instances of healing of the sick by the disciples of Jesus. (19) So then the Lord Jesus, after he spoke to them, was taken up into heaven and took his seat at the right hand of God. Acts of the Apostles gives more specific details of how Jesus was take into heaven: “When he had said this, as they were looking on, he was lifted up, and a cloud took him from their sight.” (1:9). Jesus took his seat at the right hand of God. Acts 7:55-56 gives the vision St. Stephen had at the time of his persecution. “But he, filled with the Holy Spirit, looked up intently to heaven and saw the glory of God and Jesus standing at the right hand of God, and he said, ‘Behold, I see the heavens opened and the Son of Man standing at the right hand of God.’” Though the normal posture of Jesus is supposed to be sitting at the right hand of God, here Jesus was standing as if he was welcoming Stephen to heaven. A position at the right hand of a king, Messiah, or God is symbolic of a higher rank, dignity, or authority shared with that the supreme person. When Jesus was seated at the right hand of God, he was exalted above all others in heaven. “Sitting” refers to the completion of the mission of Jesus and it also is another symbol of authority. The ancient patriarchs usually blessed their children and grandchildren with their right hand. For example, while blessing the two sons of Joseph, Jacob placed his right hand on Ephraim as the favored one. (Genesis 48:13-14). The bride of the king stands at the right side of the king (Psalm 45:9). Since most people use right hand and because it is considered stronger than the left, the right hand stands for strength. The second in rank of the king would be seated at his right-hand side. When Bathsheba, the mother of Solomon, came to the court of Solomon, he bowed before her, and then ordered to bring a second throne for her and placed at the right side of his throne to show her authority and honor in his kingdom. (1 Kings 2:19). St. Paul wrote to Philippians: “God greatly exalted him and bestowed on him the name that is above every name, that at the name of Jesus every knee should bend, of those in heaven and on earth and under the earth, and every tongue confess that Jesus Christ is Lord, to the glory of God the Father.” (2:9-11). As Christians, our goal is to reach at the right-hand side of Jesus. According to Mathew 25:31-46, there will be a separation of the faithful at the final judgement. Our position at right or left side of Jesus will be determined by how we practice our faith. The reward is for those who are eligible to be at the right side of Jesus, the supreme judge. (20) But they went forth and preached everywhere, while the Lord worked with them and confirmed the word through accompanying signs. The apostles and their followers continued the mission of Jesus and obeyed his command to preach all over the world. While the apostles and other missionaries of Jesus continued working for Jesus, he was at work with them. They function as his instruments and representatives. Jesus continues to fulfill his promise to his disciples: “I am with you always, until the end of the age.” (Mathew 28:20). St. Paul wrote to Corinthians: “We are God’s co-workers; you are God’s field, God’s building.” (1Cor. 3:9). Great changes have happened and continues to happen in the world through Christianity because of the divine intervention of Jesus through his human representatives. As mentioned in verses 17 and 18, Jesus confirmed the words of the apostles and their successors through miracles and extraordinary outcomes. The church that was like a mustard seed has grown fulfilling the parable of Jesus: “Though it is the smallest of all seeds, yet when it grows, it is the largest of garden plants and becomes a tree, so that the birds come and perch in its branches." (Mathew 13:32). 1. Our faith is based on our trust in the Lord than physical evidence or personal experience of God. Just as we believe and trust our parents, we believe in the Lord who is our creator and who sustains our life. 2. We are the missionaries of Jesus in our time and locality. The commissioning of the apostles to preach the gospel all over the world to all people is entrusted also to us through our sacrament of chrismation or confirmation. 3. Rejection of the gospel by one who had received the message of Jesus would lead to final damnation. Many people, while they enjoy the comforts of life, ignore God who created them and has been providing everything they enjoy. Rejection or disregarding God and his church is a grave sin and violation of the first of the ten commandments of God. Popes have been insisting on the need of new evangelization of fallen away Christians while continuing the regular evangelization of the non-believers. 4. We are indebted to God for our health and wellbeing. Oftentimes we see God’s providence in healing or escaping an accident. We must realize that God protects us from many mishaps that did not occur in our lives. 5. When Jesus faithfully fulfilled his mission on the earth, God the Father took him to heaven and seated at His right hand as sign of his honor and authority. We also are supposed to faithfully accomplish our mission in the world entrusted to us by God according to the teachings of Jesus. Then our death shall also be a welcoming entry to the right hand of Jesus in heaven. 6. When we serve the Lord to continue his mission, the Lord gives the result. There is nothing we can boast. As Jesus taught, “when you have done all that you were commanded, say, ‘We are unworthy servants; we have only done what was our duty.’” (Luke 17:10). However, none of our good works will go unrewarded in heaven.